It usually bothers me that the Passion story is the central Gospel read in many churches on Palm Sunday. 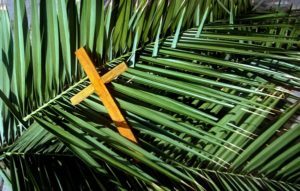 Of course most of them start with a procession of palm leaves, but the rest of the service focuses on the coming week. Seen one way, this makes sense: There are no more Sunday services before Good Friday, so the Palm Sunday service is the easiest way to have the whole community refocus on the Passion — which in turn means that Easter’s service can be all, and only, about the Resurrection, with the horrors of Thursday night and Friday all in the past. But I don’t like to rush ahead to the Passion so fast; I would rather pay more attention, as the centerpiece of the service, to Jesus’ triumphal entry into Jerusalem…. This was not a time of mass communication. Jesus was an itinerant preacher who had spent most of his time in what amounted to the hinterlands. He had no title, no wealth, little formal social standing. Yet there he was, entering the city that effectively was second only to Rome itself as the center of civilization, with throngs of people hailing his arrival. This was no ordinary occurrence. They had to be buzzworthy. They had to be amazing. Otherwise, he would have entered Jerusalem like almost any other pilgrim, little noticed and uncelebrated…. All of which leads us… well, where, exactly?